Join us for a tour of the most popular things to do in Hawaii! Visit Pearl Harbor, the Arizona Memorial, and the Battleship Missouri! Our guided motor coach tour will also take you through historic Downtown Honolulu and on a drive through Punchbowl National Memorial Cemetery! Round trip airfare, transportation, admissions and expert narration from our knowledgeable guides are included. 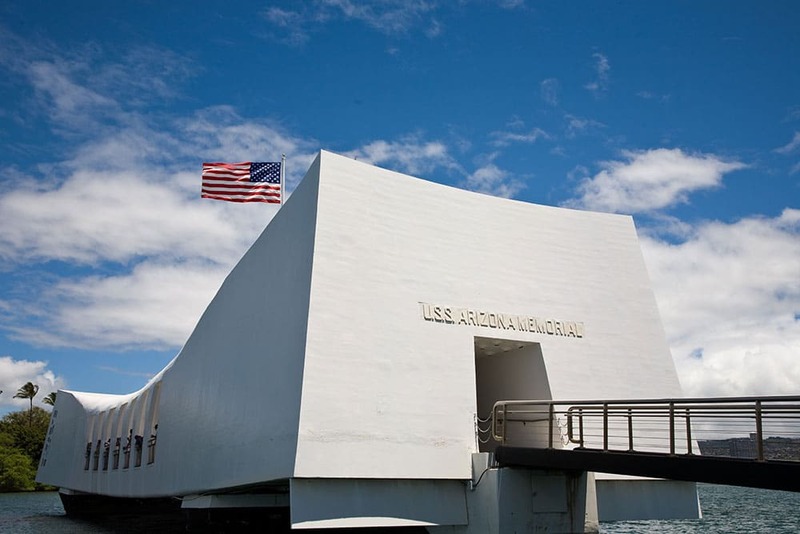 Tour the Arizona Memorial and Pearl Harbor Visitor Center! Take a guided tour of the Battleship Missouri, the last battleship built by the US Navy! Experience the top attractions on Oahu and make the most of your vacation with our Pearl Harbor Tour! Relax and travel in comfort on our motor coach tour that includes the Arizona Memorial, Battleship Missouri, downtown and historic Honolulu city tour and a drive through Punchbowl National Cemetery. This memorable, informative tour will leave you with a deeper insight into these pieces of American history. Your USS Arizona Memorial experience will start at the visitor center. Experience an excellent film documenting the attack on Pearl Harbor, with actual footage. Spend time browsing through informative displays and learn more about the events that shaped American history and took place here so many decades ago. There are snack areas and food vendors where you can grab a bite to eat and relax. Climb aboard a US Navy launch ship for a short ride to the memorial itself, which is part of the WWII Valor in the Pacific National Monument. The memorial built over the remains of the USS Arizona Memorial itself will allow you to honor and reflect on the heroes of that “Day of Infamy” You can read the names of all 1,177 sailors and marines who were killed on December 7, 1941. Your next stop on your Pearl Harbor Adventure is a one-hour guided tour of the USS Missouri, the last battleship built by the US Navy. Commissioned in 1944, and affectionately referred to as “Mighty Mo”, she earned 11 Battle Stars during her tour of duty. Walk the decks and stand on the exact spot where on September 2, 1945, Japan surrendered. In all, you’ll spend approximately 4.5 hours at Pearl Harbor. Then, experience a fun fact-filled, narrated driving tour of downtown Honolulu. This scenic drive, including a drive through Punchbowl National Cemetery, will allow you to discover the cemetery’s meticulously landscaped acres. Enjoy the beauty and honor as you drive through and see the Courts of the Missing, the chapel and the finely detailed mosaic maps of the Pacific theaters of action in World War II. You will also get to visit other popular Hawaiian sites on this tour, including the impressive ‘Iolani Palace, the only royal palace on American soil. You’ll also view Kawaiahao Church (the church of Hawaiian monarchs) and one of the oldest standing Christian churches in Hawaii. The State Library and Archives, the 18-foot tall statue of King Kamehameha, City Hall and the quaint Mission Houses are also included on this adventure tour, all while your driver recounts the rich history of these Honolulu landmarks. This tour departs Kona Airport. You will meet our airport representative approximately 6:15 AM . Flight schedules change frequently so phone our office at 808-329-8008 for confirmed meeting information. Your flight departs Kona Airport approximately 7:30 AM returning 8:10 PM. Please phone our Kona office at 808-329-8008 to confirm time of departure. There is a NO CANCELLATION & NO REFUND on all NEIGHBOR ISLAND DAY-TRIP Tours. No name or date changes will be honored once booking is confirmed.